The zinc-plated lock no. 143U can be used for left and right closing, simply by turning the spring bolt. 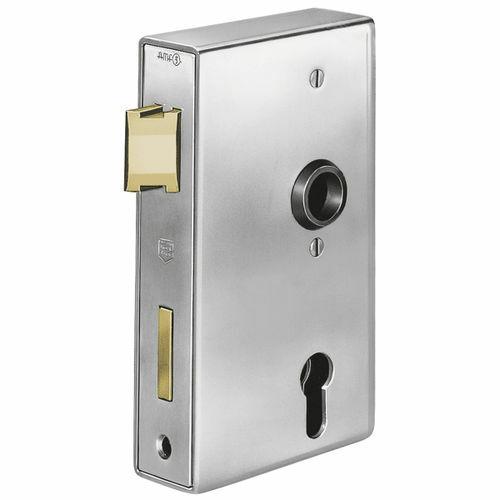 In addition to this, the optionally prepared item for profile cylinder or for Swiss round cylinder (RZ) comes with night latch, while there are 2 furniture roses of 18 mm and 4 stainless steel screws. The backset of 40 mm and a rotation 1 turn, with a spindle of 8 mm and a spring-bolt projection of 2 mm are other major advantages. Last but not least, the bolt projection of this item is of 3 mm.